- Publisher A beautifully illustrated family prayer book in the style of the bestselling Celtic Benediction and Sounds of the Eternal, J. Philip Newell's new book engages with the realities of family life in today's world with sensitivity and imagination. In language that is striking for its simplicity and beauty, thought provoking stories, prayers and readings are provided for each day of the week over a seven-week period. Each section reflects a favourite theme of Celtic spirituality: Book One: Stories of creation; Book Two: Journey and freedom; Book Three: Calls for justice; Book Four: Sayings of wisdom; Book Five: Songs of joy and sadness; Book Six: The gospel of Jesus; Book Seven: Life in community. Illustrated in colour throughout, Celtic Treasure offers a spirituality for daily life and a challenge to engage creatively with the needs of the world around. A beautifully illustrated family prayer book in the style of the bestselling Celtic Benediction and Sounds of the Eternal, J. Philip Newell's new book engages with the realities of family life in today's world with sensitivity and imagination. In language that is striking for its simplicity and beauty, thought provoking stories, prayers and readings are provided for each day of the week over a seven-week period. Each section reflects a favourite theme of Celtic spirituality: Book One: Stories of creation; Book Two: Journey and freedom; Book Three: Calls for justice; Book Four: Sayings of wisdom; Book Five: Songs of joy and sadness; Book Six: The gospel of Jesus; Book Seven: Life in community. Illustrated in colour throughout, Celtic Treasure offers a spirituality for daily life and a challenge to engage creatively with the needs of the world around. 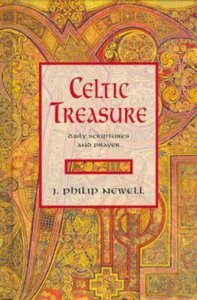 John Philip Newell is a poet, scholar, teacher, and Church of Scotland minister recognized for his work in Celtic spirituality and passionate about seeking peace in the world and harmony between its great spiritual traditions. His books include Listening for the Heartbeat of God: A Celtic Spirituality, Sounds of the Eternal: A Celtic Psalter, and Christ of the Celts: The Healing of Creation.